cords are one of my biggest pet peeves. we have to bring tons of power cords to run all over the ground when we teach blogshop and they definitely aren’t good looking. it’s hard when you put so much effort into the looks of an event and then the cords come in and mess with it. in our office, there’s cords all over the place too, so we figured we would make them at least look a little better if they have to show…and what’s so great about this project is that it’s VERY simple and you can customize them to match any room! 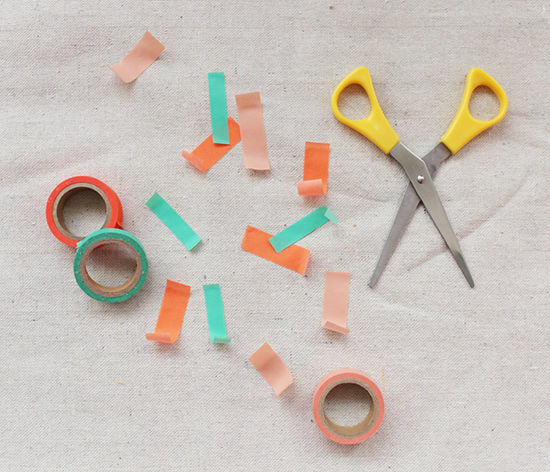 • cut pieces of tape 1.5 inches long. 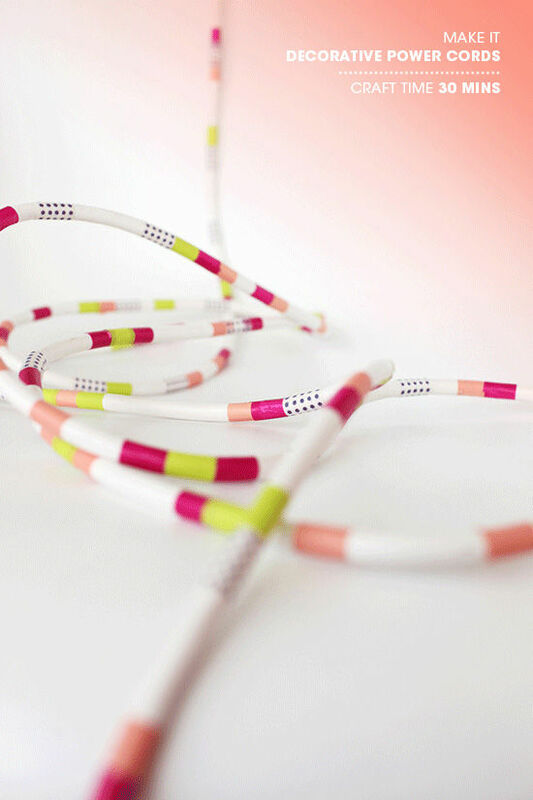 • wrap washi tape around cord in irregular increments, we overlapped our tape in some places and next to each other in others. 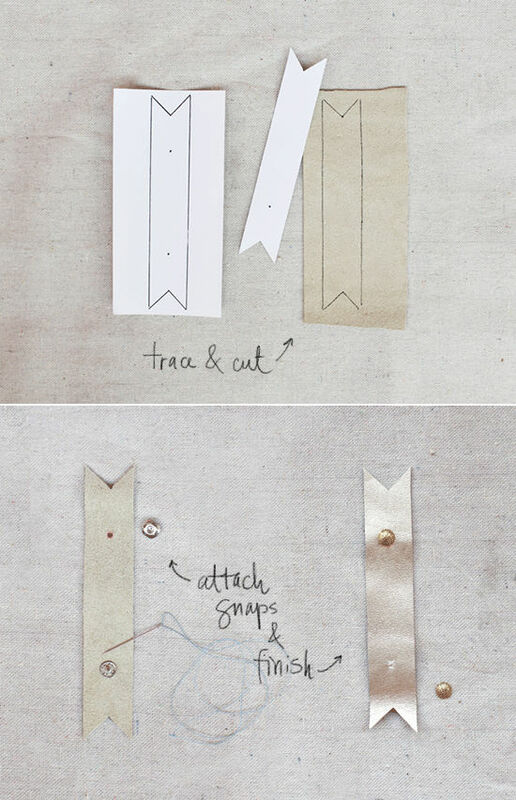 • create and cut a paper template. we made 3 sizes, 1×5, 1×6 and 1×7 inches. • trace template on backside of leather and cut out. • measure 1.5 inches from the ends and mark with a pen, this is where you will sew the snap. • if you want you can cover the stitching with a flat back embellishment (we found ours at michael’s) and glue on, you could also use a small button or if you have access to a snap setter you can use that as well. what do ya say? are you going to try this one out for yourself? and stay tuned for our office makeover post very soon! I haven’t used washi tape must, but I’ve found that when I use adhesives on projects, that over time dust starts to stick to the edges. Since power cords tend to be in more dust-prone areas, I wonder if that would happen with these? what’s so great about this project is that it’s VERY simple and you can customize them to match any room! Great idea Bri ! Definitely makes a cord look glam as suppose to hitteous. I love this! 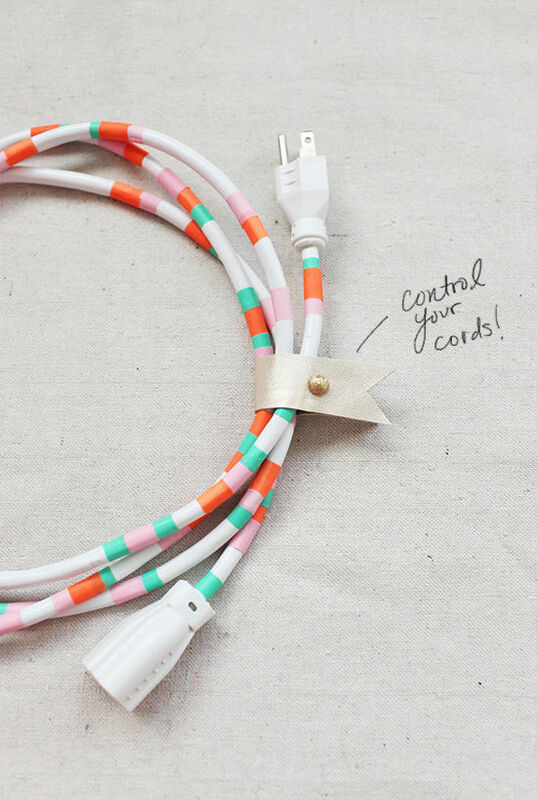 I’ve been rearranging my living room/home office and wondering if I could successfully use washi tape to dress up some of my icky computer cords–now I know! Bri – you really know how to take creativity to the next level. Nice way to upgrade utilitarian objects. Thx! So cute, love this DIY! Cords can be soo annoying, but you’ve just made them a little bit tolerable. This is a DIY I can get behind. Washi tape is handy! That’s so easy to do and the result’s so cute! I’m gonna try it someday. I mean, come on. This is genius. eeeeeek! No way this is a must do! Cute-cute-cute, thanks for the brilliant idea! wires are the bane of my existence! (and have you noticed how dudes love them?!) this is the perfect solution for prettifying a necessary evil. absolutely must do. thanks! bridget, i really think guys DO love them. do they make them feel manly or something? ha. I’m such a geek for all things colourful and organisational. And this has gone straight to the top of my to do list. I love DIYs that turn a permanent eyesore into something beautiful. I’m going to do this to my computer cord! Great idea! The simple ideas are always the best. Love this. Looking forward to trying it myself. What a great idea! I’m definitely going to try this. This is such a lovely idea. Thanks for sharing. Awesome, you guys. Just awesome. Now I must get some washi tape! Love this so much! Like, I actually want 7,000 extension cords in my place now. this is such a perfect idea!! my husband is like a power cord nazi. every one must be hidden. maybe he’ll ease up if they’re this cute! While covering electrical cords may be ideal for the aesthetics of a home, it doesn’t allow the wires to dissipate heat safely. If an electrical cord is covered by a rug, blanket or piece of furniture, it may cause the wires to overheat and start an electrical fire. Love love love love this idea! Haha, I would have never thought of this! So cute AND smart. 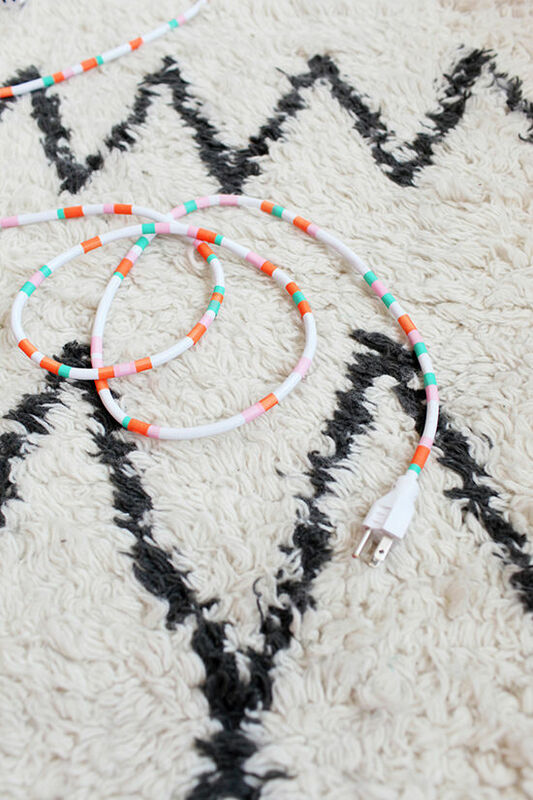 I may have to do this with my computer cords… because they have been overwhelming me! GREAT idea! Absolutely love this! I live in a house with a bunch of girls who all have Macs, and people are forever losing/mixing up chargers. This is a perfect way to keep track of mine and make it look cute to boot! Great idea! I’m totally going to try this. Where is a good place to buy washi tape??? Cute! I do wonder if these start looking really ratty/collecting dust after a while? I really think it’s a cute idea though, and will have to give it a try! SUCH A COOL IDEA!!! 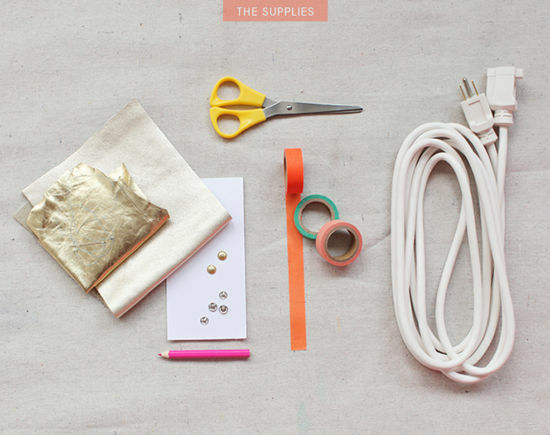 I hate power cords too- this is a fantastic DIY- I can’t wait to get started! where is the washi tape from ??? Hello Bri!! I really love your site and gives me so much inspiration!! I’m a fan from Greece!! Hello there, You’ve done an incredible job. I will definitely digg it and personally recommend to my friends. I’m sure they’ll be benefited from this web site. you might be right now. You’re so intelligent. You recognize thus significantly on the subject of this subject, made me personally imagine it from so many various angles. Its like women and men aren’t fascinated until it is one thing to accomplish with Woman gaga! Yes! Finally someone writes about Best Linux Hosting. It’s a shame you don’t have a donate button! I’d most certainly donate to this superb blog! I guess for now i’ll settle for bookmarking and adding your RSS feed to my Google account. Normally I don’t read post on blogs, but I would like to say that this write-up very compelled me to take a look at and do it! Your writing style has been amazed me. Thanks, quite great article. I’m gone to inform my little brother, that he should also pay a quick visit this web site on regular basis to get updated from latest information. Great web site you have here.. It’s difficult to find excellent writing like yours these days. I really appreciate individuals like you! Take care!! your blog and will come back someday. I want to encourage you to definitely continue your great job, have a nice day! Stephen, I got the first letter and every one after EXCEPT Margaret Cho’s. Can you remedy that, please? Superior website I discovered info extremely informative. I come here every one of the time and they generally deliver very good content! Hi there, everything is going fine here and ofcourse every one is sharing data, that’s in fact good, keep up writing. Good day very nice web site!! Guy .. Excellent .. Superb ..
we’d like work out more strategies in this regard, thanks for sharing. I would take this one step farther. I have the hardest time figuring out which cord I need to grab to unplug, when there are multiple cords all over the place. 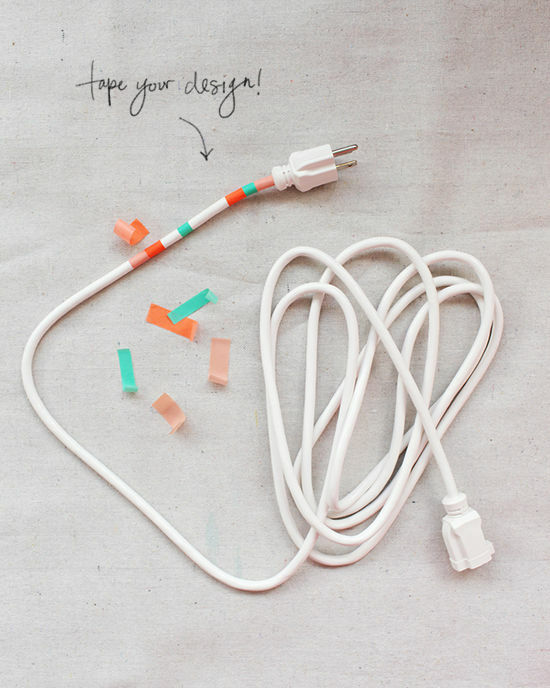 I’d use this idea to decorate them, but use a different color for each cord. Voila! Easy to follow the cord from origin to its end! and unrealized profit (loss). While You Wait Acer Laptop Motherboard Repairs Service:. the high costs of battery replacement. Last 7 days I had to consider a flight from California to New York. Venapro is proper for you. You’ve made your point extremely effectively.! take care of to keep it sensible. I can not wait to learn far more from you. the monthly payments on time. I would recommend talking to family and getting a job immediately. If you are reading this and you are in this situation, I have some helpful hints and tips that can help you over come cash flow problems that will enable you to keep on top of bills and pay them on time, every time. love the guide… and nice stuff.